One of the most unusual events that our new home town of Tacoma, WA, features is the annual spring Daffodil Festival. 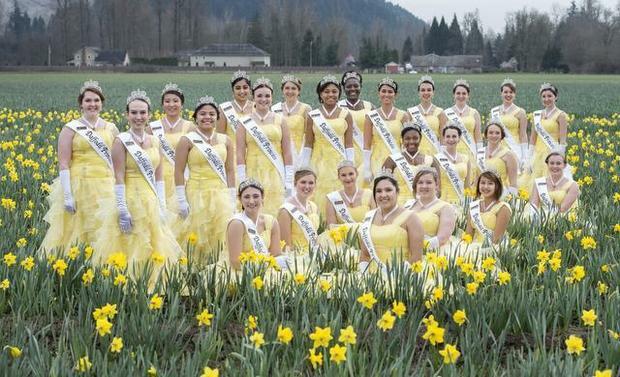 Twenty-four high schools in Pierce County each choose a Daffodil Princess, and one of the princesses will be crowned Daffodil Queen. You can read about this year’s princesses in this article. The Daffodil Festival started in 1934 to celebrate the agricultural industry in the area around the city of Puyallup (pronounced pew-AL-up; named after a local Native American tribe), a bit south of Tacoma. Daffodils arrived in the Puyallup Valley in around 1925 to replace the area’s previous large crop, hops. Now about 200 varieties of daffodil thrive in the area’s rich soil. After the first parade in 1934, the festival became a celebration of community spirit and grew to encompass four cities—Tacoma, Puyallup, Sumner, and Orting—in Pierce County. There has been a parade every year since 1934 except for the war years of 1943–1945. The annual parade features high school bands, floats, businesses, and local organizations. A candidate must be a senior – in regular high school attendance. Never have been married or may not marry during the current Festival year, ending September 30th. Never have given birth, nor shall become pregnant during the current Festival year, ending September 30th. Never have been found guilty of committing a felony. A candidate must attend at least one class at the school that they are representing. At the coronation program to be held on Saturday, March 28. 2015, all the Daffodil Princesses will be judged on academic standing, personality and attitude, speaking ability, appearance, sociability, and impromptu speaking ability. One of the young women will then be chosen to reign as Daffodil Queen until the end of the season on September 30. Many Festival activities are held throughout the season.